Champagne Nicolas Maillart has 8.5 hectares in the Montagne de Reims which is 75% Pinot Noir and 25% Chardonnay, all Premier and Grand Cru. Most of the vines are ideally located 1/2 way up the hillsides. They are located in Bouzy (1 hectare), Ecueil (3 hectares), and Villers Allerand (3.5 hectares) The family has been involved with wine for a long time and has been growing vines in the nearby village of Chamery since 1753. They practice sustainable viniculture. As much as can be done by hand is, such as pruning and harvesting, all fertilizer is organic, and the soil is tilled. Fermentation takes place in both in tanks and barrels, reserve wines are aged in barrels, and a low dosage is used. Nicolas is a very young guy and clearly knows what he is doing. Most everything is done organically and the wines from the entry level Brut Palatine on up are loved by the critics. The entire operation is very "green" with a low carbon footprint in part due to 130 square meters of solar cells. His wines can be tough to find, and I hope to find and try his fascinating sounding Les Chaillots Gillis and Les Franc de Pied, 100% old vine Chardonnay and Pinot Noir respectively as described below. 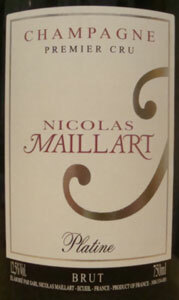 Brut Platine - Mostly grapes from Ecueil, 80% Pinot Noir and 20% Chardonnay with 40% reserve wines. Temperature controlled fermentation in stainless steel, with some reserve wines in oak. 10 grams/liter dosage. Brut Rose Grand Cru - This Rose is 70% Pinot Noir and 30% Chardonnay. Made by the saigneé or “skin contact method” with 52 hours of maceration on the skins for color. Temperature controlled fermentation primarily in stainless steel and some in oak, with some reserve wines in oak. 7grams/liter dosage. Brut Millésime 1er cru - 65% Pinot Noir and 35% Chardonnay. Temperature controlled fermentation in stainless steel with some of the blend spending time in oak. 5grams/liter dosage and an average of 5 years of maturing in the bottle. Cuvée Prestige 1er cru - Similar to the Brut above, but only 3 grams/liter of dosage and 15 years maturing in the bottle. Only made in superlative years. Les Chaillots Gillis - This Blanc de blancs is 100% old vine Chardonnay from Ecueil and Bouzy fermented in oak barrels with regular battonage, no filtering, no malolactic fermentation and only 2 grams/liter of dosage. Les Franc de Pied - A 100% ungrafted old vine Pinot Noir Blanc de noirs from Ecueil fermented in oak barrels, no filtering, no malolactic fermentation and only 2 grams/liter of dosage. Nose - ripe yet firm pear and orange peel, small flowers, minerals in the background. Slightly sweet orange flowers, a touch or orange juice, delicate and feminine. Slight creaminess on the palate, with an almost ginger ale like feel. Pears and apples as it warms. Very well balanced and elegant! Hard to believe this really is mostly Pinot Noir. I paid around US$34 and at that price certainly a good deal!